So many good things are coming out of the garden this time of year…it makes all the cold, wet planting in spring worth it. Today we had a small grilled steak with a little chipotle spice and the remains of our crunchy potato salad from the weekend. Paired with a lovely mix of greens (mizuna, Simpson lettuce, romaine, and red leaf lettuce) topped with green onion and mushrooms, dressed in a balsamic Dijon vinaigrette, it truly was the taste of summer at its best. Good Morning! Those of you who know us as walkablefeast, news flash! We’re headed for the coast. Today we are getting ready for moving day, when we will head for Nova Scotia. Our new home takes us from the urban centre to a less walkable country property. But our commitment to local food and local providers is not diminished. After fuelling up on some homemade Ontario strawberry jam, we’ll begin chronicling the foods we encounter as we drive cross-country…and ultimately land in our new space near the sea. We’re now eatcoastal, and things are about to get a whole lot saltier around here. Those are the sort of touches that make you know you’re at home, even if your “real” home is miles away. And they’re also what make you want to be a small shop shopper, and turn in your big box membership forever. 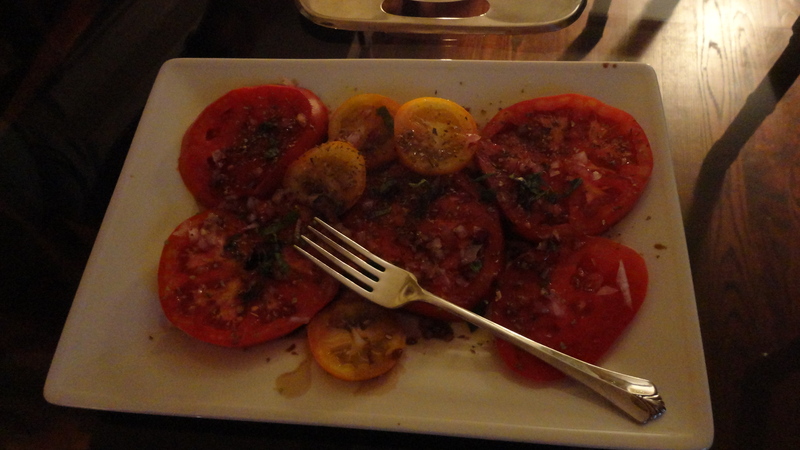 Tomatoes, and More Tomatoes…What Next? September is tomato-canning month. After putting up dozens of jars of diced and ground tomatoes, salsa, and sauce, we still had more tomatoes that needed to be used. We were incorporating them into breakfast, lunch, and dinner. Here, some tasty huevos are nestled in a spicy tomato stew – a great way to add some zip at the start (or end) of your day. Lightly saute a diced onion and a couple of hot peppers (we got these ones from our garden, but the selection is wonderful these days at local farmer’s markets). Then dice 2 or 3 large, juicy tomatoes and add them to the pot. Reduce the heat and simmer until the onions are soft. Crack in a couple of eggs for each serving, cover the pan, and continue to cook until the eggs are just set. We at ours with a side of homemade multigrain toast. Author WalkEatLivePosted on October 17, 2011 Categories BreakfastTags eggs, farmer's market, local food, locavore, menu planning, neighbourhood, recipes, spicy, tomatoesLeave a comment on Tomatoes, and More Tomatoes…What Next? It's World Food Day. Do You Know Where Your Food Came From? We love being lucky enough to walk out in our neighbourhood to buy food. Sometimes it’s from small shops where we know the proprietors and they know the source of the food they’re selling. Other times, we’re lucky enough to get it direct from the farmers. Even luckier, is that we’re never truly hungry. Today groups around the world are celebrating World Food Day. We’ll be giving thanks for the food we have, and doing our part to support our local food bank. We hope you will, too. Author WalkEatLivePosted on October 16, 2011 Categories Healthy Eating, Slow Food, Uncategorized, VegetarianTags cooking, farmer's market, food, health, local food, locavore, neighbourhood, World Food DayLeave a comment on It's World Food Day. Do You Know Where Your Food Came From? Well, although we had a warm, sunny Thanksgiving, it will turn chilly soon enough. So we’ve been busy gathering what we can from the garden, preserving, freezing, drying and cooking the fruits of our labours so we can enjoy them all winter long. In the food processor, chop some garlic (1-3 cloves, as you prefer it). 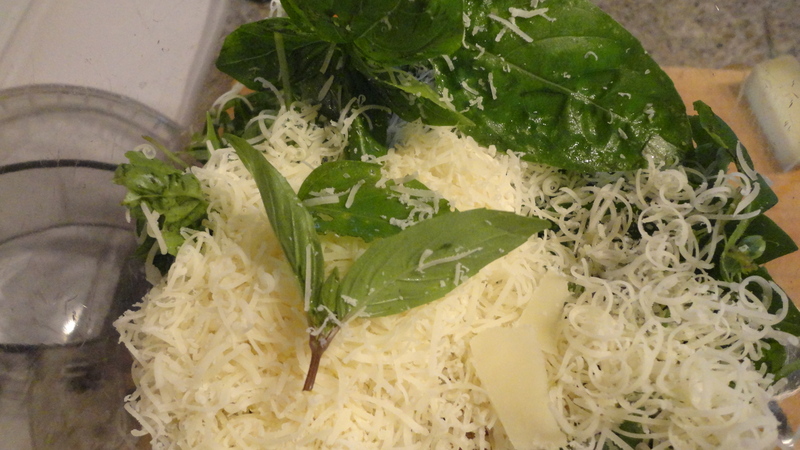 Then add a couple of good handfuls of basil leaves, about 1/3 cup of walnuts, and a couple of ounces of parmesan cheese, freshly ground. Traditionalists use pine nuts, but walnuts are always easier to find, especially in the fall. Besides, they appeal to our frugal natures. Pulse it until it’s coarsely chopped, then, with the food processor running, pour extra virgin olive oil in the spout until it reaches a thick, saucy consistency. Store in mason jars, topped with a layer of olive oil, in the fridge for a week or two (add more oil each time you take out some pesto), or in the freezer if you want to keep it longer. Simply thaw it in the fridge the day before you want to use it. We love the many uses of pesto – as a base for pizza, tossed with some pasta, rubbed on a chicken, or mixed into a homemade vinaigrette. We could go on and on…but instead, we’ll stop for now (and maybe make some more pesto). It's Lamb and it's Friendly! Yesterday, on a drizzly day, we took a midday break and headed for The Friendly Butcher. Despite the gray, chilly atmosphere, “Oz” and “Buddy” (sorry, we didn’t get your names – these are your new monikers) entertained and amused us with their positive attitudes and their helpful advice. Here, a tasty lamb chop, browned with some aromatic olive oil, celery, onion and garlic. 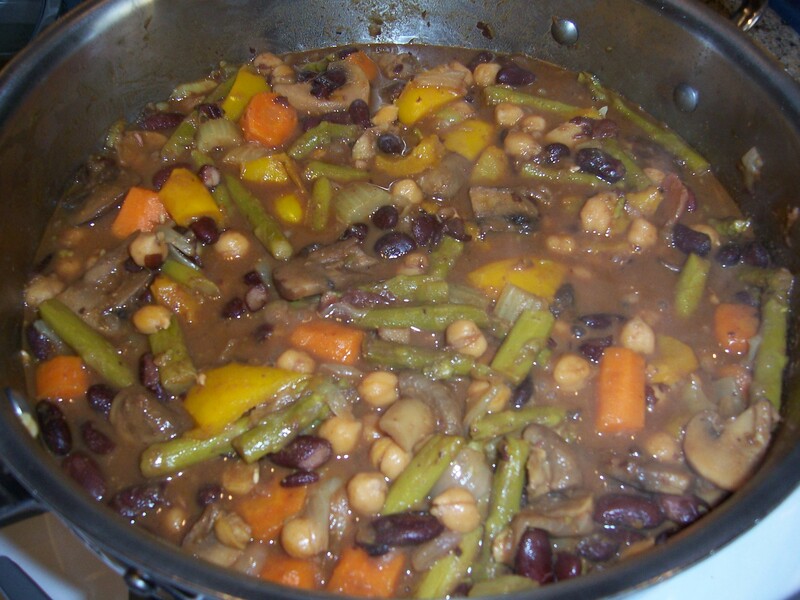 We deglazed with a little red wine, then mixed in a spicy pepper from the farmer’s market, oregano, mushrooms, and olives. Finally we chopped in a huge yellow heritage tomato from The Big Carrot and let it braise in the oven for about 45 minutes at 400F. Meanwhile we cooked some red and blue fingerlings with the skins on. When it was all done, we mashed the potato with a little milk and butter. Ahhh, friendly lamb, friendly fall. 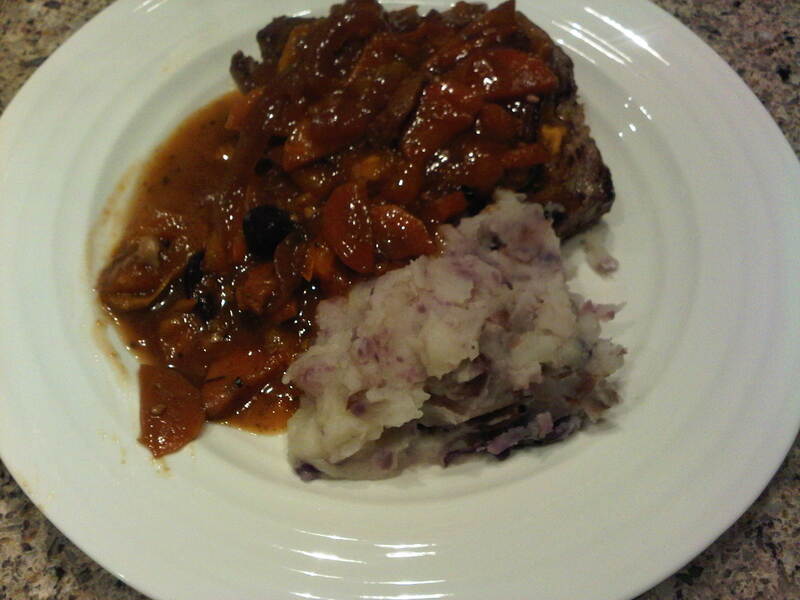 Author WalkEatLivePosted on September 20, 2011 Categories Cold Day Food, Healthy Eating, Recipes, Slow FoodTags braising, Home cooking, lamb, local food, locavore, neighbourhood, recipes, tomatoes, vegetables, wineLeave a comment on It's Lamb and it's Friendly! Ripe, juicy peaches – mmm! They look so tempting at the Farmer’s Market. We freeze some. We make jam. We put batches up in jars. Yet still, we keep buying them, because they’re so delicious. Then suddenly, they’re all ripening at once! Here’s a tasty and different way to use them up. 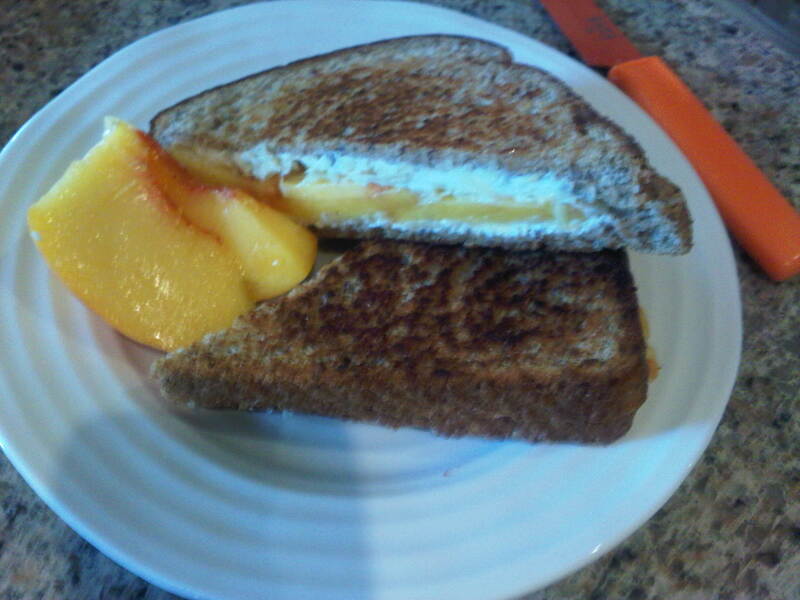 We took 4 slices of whole-grain bread, and spread them with Organic Meadow cream cheese. Then we grated a tiny layer of delicious goat cheese from Montforte on one side. Next, grate a bit of fresh ginger, and top with thin slices of fresh peach. Top with the second piece of bread, and butter the top. Grill in a nonstick pan with just a little butter, flipping when they’re golden. Author WalkEatLivePosted on September 14, 2011 Categories FruitTags cheese, farmer's market, fruit, Home cooking, local food, locavore, peach, peaches, recipes, seasonalLeave a comment on Just Peachy! What a great day it was when we learned to make this delicious tomato salad from a Jamie Oliver cookbook! The farmer’s markets (or if you’re lucky, your back yards) are full of them now. Of course we’ve made it often enough we keep adapting it, so it’s not exactly as it was. 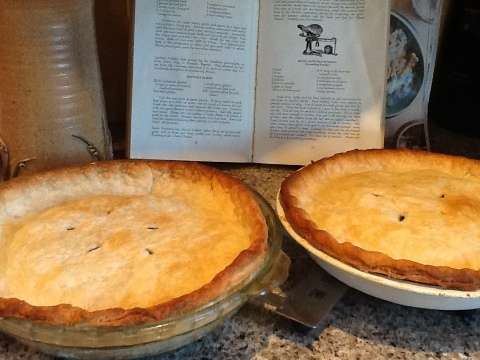 In this case we used some red onion from the market, the usual dried oregano, balsamic, EVOO, and pepper. Then a chiffonade of basil from the urban farm, to top it off. Goes with anything, or itself. Mmmm. It’s true. Alfresco dining days are disappearing. But while we can, we’ll keep enjoying the backyard dining opportunities. 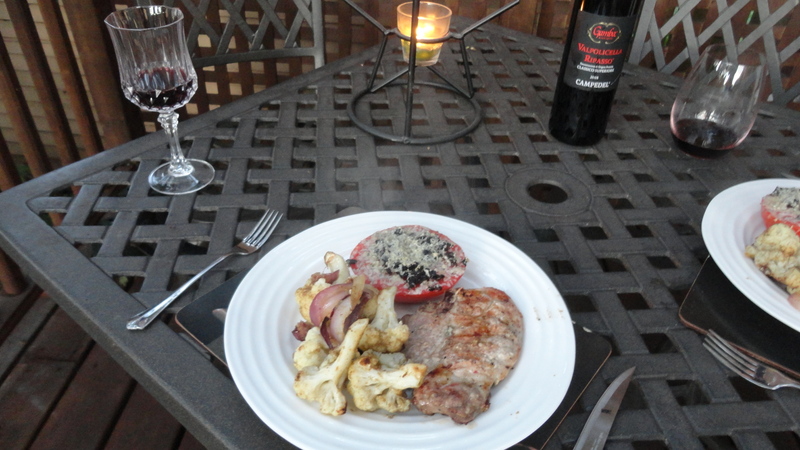 We grilled a regular grocery store Ontario pork chop (from Valu-Mart, down the street). It would be nice to do butcher shop chops every day, but it’s hard on the budget, so we do that as often as we can. These were dusted with a little bit of ground coriander. On the side, we served cauliflower from the East York Farmer’s Market, and a grilled tomato topped with ermite cheese from Quebec. The tomato was fresh from our neighbours’ garden – even closer than the farm! The cauli came from the East York Farmers market. Go farmers!